The Minister for External Affairs, and the dominant force in the formation of Australian foreign policy for a crucial decade in the battle over Palestine (1941-1949), Herbert Vere Evatt played a central role in the Australian political response to Zionism and the conflict in Palestine. 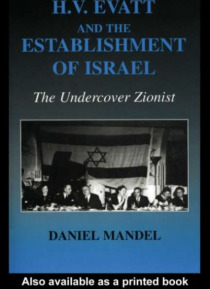 This book, which uses a variety of primary sources from Australia, Israel, the United Kingdom and the United Stat… es, provides a valuable study of Evatt the Zionist, as well as illuminating a fascinating political figure. This valuable book charts the debate in Australia over the creation of a Jewish state as well as providing a genuinely entertaining study of Evatt himself.